A visit to The Biltmore Estate is like taking a step backwards to a golden era where elegance reigned. The largest private home in America, as this incredible structure remains in the hands of George Vanderbilt's heirs, has been formally open to the public since 1930. It was the true passion and legacy of Vanderbilt and that same sentiment is obviously shared by his descendants who graciously open the home to tours today. Ready for the total? The home contains 250 rooms, 34 bedrooms, 43 bathrooms, 65 fireplaces, and an underground swimming pool. The grounds were designed by Frederick Law Olmsted (of the Central Park fame) and the home as well outlying structures such as the dairy (now the winery) and the stables, by Richard Morris Hunt. My family and I spent our Thanksgiving holiday in the mountains of Asheville, North Carolina and we had the pleasure of visiting the estate decorated for Christmas. The curators have done a magnificent job ensuring that the home looks just as it did during the hay day of estate, perhaps even a bit better. 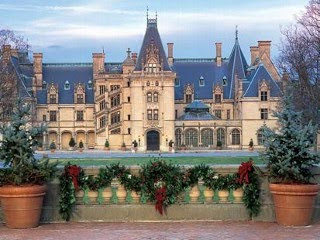 When visiting the Biltmore Estate, make a day out of it. Go early and leisurely stroll the grounds, enjoy a delicious lunch at the stables and take your time as you meander through the home. 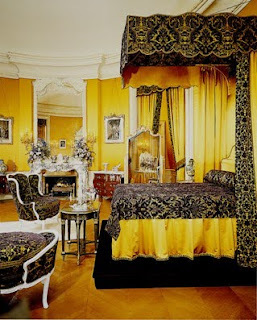 I highly recommend the audio tour as it provides a charming glimpse into the glamorous lives of the Vanderbilt's. Highlights for me include the lovely Winter Garden, the wild and whimsical Halloween Room (note to self- must encourage guest to paint the walls of my basement after a few bottles of wine) and the two Renoir paintings hanging in the nicely appointed Breakfast Room. Find out more information about this stunning home and events here. 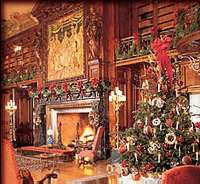 The estate will be decorated for Christmas through January 3, 2010. If you are in the area, or even if you are not, I suggest a trip to America's largest private home. *Images from examiner.com, carolinaconnosseur.com and ricmorgan.files.wordpress, about.com. This entry was posted on 10:27 PM and is filed under Biltmore Estate . You can follow any responses to this entry through the RSS 2.0 feed. You can leave a response, or trackback from your own site. I have always wanted to go there!!! C and I traveled to Biltmore a couple of years ago, it was beautiful! I'm sure it's just gorgeous at Christmas! What a gorgeous place! We spent our Thanksgiving in the mountains in Clayton, GA. We drove into Franklin, NC one day. It's a charming little town! This is one of me and my hubby's favorite places to visit. We have been a couple of times in the spring, but never at CHristmas. It is something definitely on our to do list! 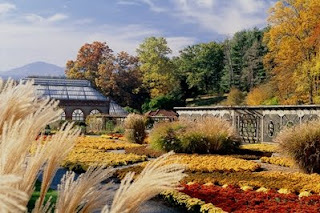 Great Blog...I want to go to the Biltmore when the gardens are in bloom. The whole Estate pulls on my heartstrings! 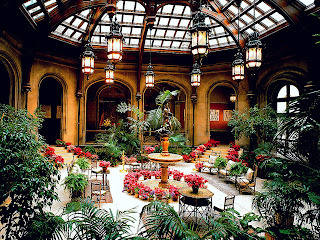 We visited the Biltmore during the holidays a few years ago. It was gorgeous! We had dinner at the lodge on the grounds and then went over for a tour. I highly recommend it this time of year. Of course, I'd love to see it in the spring, as well, when the gardens are in bloom. What a gorgeous home. I love remembering the days of time past. When my son was still in college, he went to Asheville for the weekend with a friend whose dad worked on the estate. They had a grand time seeing all kinds of behind-the-scenes things. I love the Biltmore! It is such a great piece of our Americana history. Too huge to imagine. Great post! Thank you for all of your comments. The Biltmore truly is magnificent and a great place to visit. Happy Holidays! Delightful post! Just adorable that there are 2 Renoir's in the Breakfast Room - the VDB's knew how to commence the day in style.